Marble is a metamorphic rock that comes from metamorphosed limestone or dolomite. 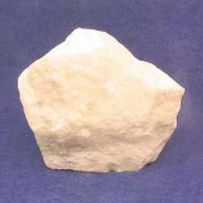 Limestone is mostly calcite or calcium carbonate, CaCO3. Dolomite CaMg(CO3)2 is related to limestone but is rich in magnesium. Marble has a uniform texture (non-foliated). There is a lot of variation in the color and texture of marble. The two main influences are the kind of limestone that makes up the parent rock and the kind and degree of metamorphism. It can be most any color including white, black, reds, greens, and more. It is usually course grained though fine-grained marble is found in some places and is highly prized for creating sculptures. The quarry at Carrara, Italy is probably best know for this kind of marble. Marble is used as building materials for its strength and beauty. 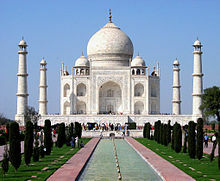 The Taj Mahal in India, pictured here is entirely clad in marble. Marble will fizz when in contact with acid. Vinegar can be used as a test.